Congratulations to Magnus Carlsen for retaining his World Champion title! Today was THE day. After 12 draws, there was no escape for one of the contestants. Four rapid games at 25 + 10 pace, and if still tied, the Blitz mini-matches, at 5+3 pace. Carlsen showed his superiority at shorter time controls. He won three Rapid games, back to back, closing the match. In the first game, Caruana had the chance to hold the draw and prolong the playoff, but he missed a crucial move, giving Carlsen the go to take the full point. Games 2 and 3 actually had no story to be told. 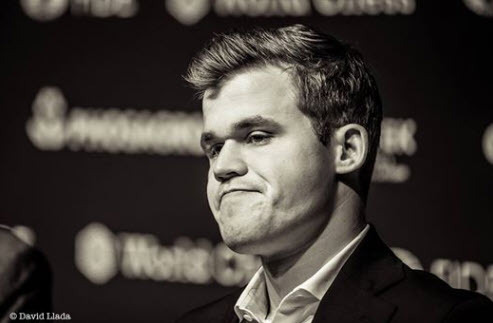 Carlsen crushed his American opponent. In this fantastic photo by David Llada, Magnus seems to think "Good day at work!" Another Sicilian. And OK, nothing wrong about it. The tension is high, very high. This last game of the Classical match can mean everything for Fabiano. At move 13, Caruana decides to avoid an easy repetition, and the fans breath a sigh of relief. At move 21 Fabiano goes in for the war and plays then unexpected Rh2?! with the idea of moving the rook to the Queenside, and probably castle. But the bold move proved to be a bit too much, and Magnus gained momentum, with the World Champion entering a very promising position, despite some minor inaccuracies. 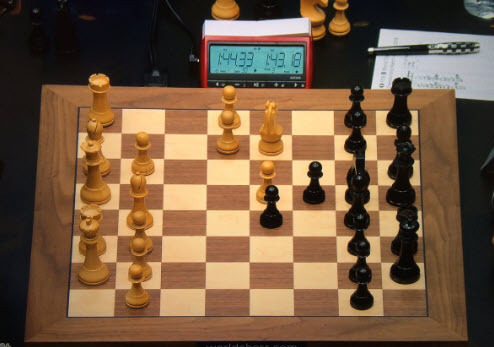 By move 31, Caruana had only 8 minutes left on the clock, and a rather complicated situation to handle. Carlsen's advantage was not decisive, but it was super-easy to play for black, whereas even a minor slip by white could have led to disaster for the American. 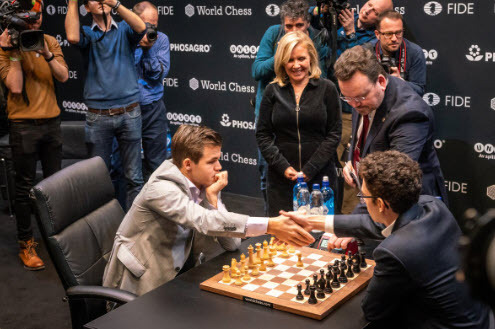 At this point, the nerve-wracking game was for sure the most interesting of the whole match and... Carlsen offered a draw, which Caruana took without hesitation. The Internet wave was almost visible in real life. The top of the wave was clearly shaped in the form of a single word: WHAT? In fact, it looked impossible that Magnus Carlsen, the strongest player of the World, and one of the strongest ever, had offered a draw in such a promising position. Kramnik, who was a guest commentator in St Louis, was incredulous. Then, after the shock, he erupted with a quite frank statement: "It's a shame for black to offer a draw in such a position!". 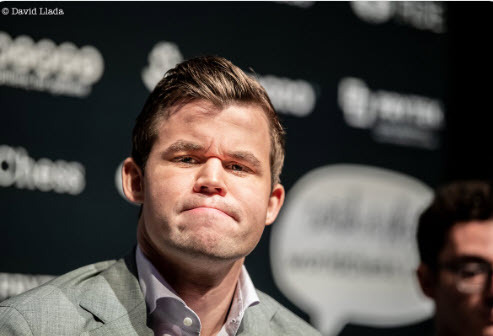 Carlsen said he was not so impressed with his a5-a4, and that he underestimated Qb4. Anyway, what really happened is in the head and heart of the two players. We can only speculate. But one thing is true: in 2018 we will have a World Champion who has not won any classical game in the match. Which, frankly, sounds a bit odd. 11th draw! One game to go now. Will one of the two chess geniuses prevail before the dreaded tiebreaks? We'll know pretty soon! Dead Calm. But apparently this time the two sailors won't meet a deranged boatman ready to wake them up and make the plot interesting. And, frankly, neither Fabiano nor Magnus can compete with a young Nicole Kidman. Jokes aside, today the Champion and the Challenger, for the first time, didn't even try to push each other. It was a flat game from beginning to end. No Sicilian when Carlsen plays White, therefore a nice 'n easy Petrov Defense. Engines today didn't shake the public, as the perfect play by the two contestants did not allow the silicon guys to scream "Advantage! There is a line that will lead Magnus to victory in 165 moves!". Not even when Caruana went down a pawn. People on the socials have been trying hard to avoid the adjective that would describe today's feat in a proper manner, and our flights of fancy are not helping a lot. Let's say it, brutally: it was a boring game. Which is not that bad, considering that out of eleven games probably this was the only very flat one. In the last game, due to be played on the 26th, Fabiano will conduct the white troops. Last chance for the American to avoid the Rapid and (possibly) Blitz tiebreaks. Tomorrow is a rest day, and GM Alex Yermolinsky will be LIVE on ICCTV to analyze and commentate the World Championship Match. Don't miss the show! Ten draws, but a great battle over the board! With two games to go, Carlsen and Caruana are locked 5.0/5.0. Will one of the two chess geniuses prevail before the dreaded tiebreaks? Fifth Sicilian out of five games Caruana has played with white in this World Championship Match. 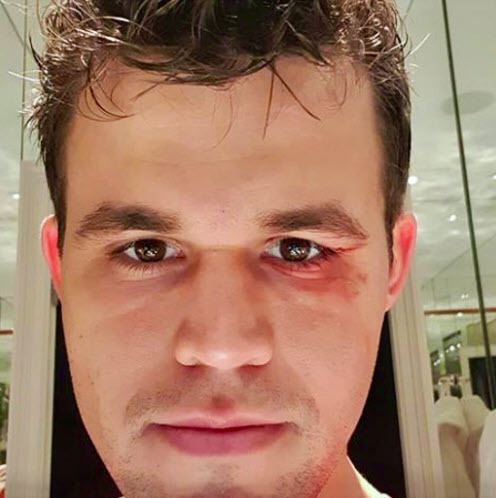 Carlsen accepted to get again into a Sicilian Sveshnikov, after the unpleasant experience in game 8. The commentators were a bit surprised when the first moves of Game 10 were made. The first reactions went on the line "will Fabi play Qh5 this time?". But the challenger had a novelty ready: 12.b4. It actually didn't seem to worry Magnus too much, and the opening went on to leave Fabiano with a very tiny advantage. Then Carlsen started getting aggressive, and his play seemed to become convincingly "pushing". At move 23, the social drama unleashed again: Magnus played Qg5? !, which had the Engines give 130 centipawns of advantage to Caruana. Holy moly! It was almost the end of the - chess - world. For the time that Caruana invested in playing his next move, the world was about to collapse. But then the silicon brains went back to sleep, with their laconic 0.00. The endgame, despite the engines giving Fabi some advantage, was a dead draw. Carlsen, after that dubious Qg5, showed once more that a great champion is, necessarily, a great defender. It was an excellent game, played at a fantastic level. Magnus and Fabiano pushed each other to the limit, though neither could bring home the full point. With two games to go, it's almost natural to predict that the two contestants will be super-cautious now. But with these chess geniuses, you never know. Tomorrow is a rest day. 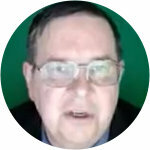 ICC will have GM Alex Yermolinsky analyze and recap Games 9 and 10 LIVE on ICCTV! Tune in at 3 PM EST - 21:00 CET. As the adagio goes "Another day, another draw". It's the ninth draw out of nine games, and the score is locked, with three games to go. Today we felt it was back to normal, with white being able to put black under some pressure, but nothing really decisive. Carlsen said to Norwegian TV that he's frustrated: "It was a very promising position, but it's not so easy to improve my position even though it looks very nice. Then I made a ridiculous move that led to a draw. I don't know what else I could've done.". The Champion didn't look happy at all. Someone hints he may be experiencing a bit of a crisis, needing to win a game desperately. It sounds a bit too dramatic, actually. Carlsen knows that should the match go to the tiebreaks, he's the one to win it. Yesterday, even during the rest day, Carlsen made the news. He suffered a head injury playing soccer, and today - probably for the first time in history - we could see a World Champion at the board sporting... a black eye. Doctors said that no concussion occurred, and the incident won't influence Magnus' play. All is well, luckily. Magnus posted this photo on Instagram, with the funny post "The match is heating up"
In today's game, after Caruana's 17. ... Bxf3 the Engines woke up and started giving a slight advantage to White. We know that Magnus can use even a minor advantage to bring the point home, but after some good moves, Carlsen went with 27.Bf3, which put Komodo, Sesse and all their silicon friends back to sleep. In the endgame, Carlsen was able to create some worries for his opponent, with the a-pawn running towards touch-down, but the fierce bishop of the American didn't give the small soldier a chance to promote. They played on until move 56, but it was really hard to squeeze anything from the position, at that point. So, the tension mounts, and now Caruana will play White twice in the last three games. Though it hasn't been a real advantage to play White in this match - at least so far - psychologically it might be a small advantage for the St. Louis based American challenger. Tomorrow Game 10, same place, same draw err... I mean same time. By move 21 in a Sicilian Sveshnikov, all the engines, and consequently everyone watching Game 8 of the Match, was screaming hysterically c5! c5! c5! 35 minutes later, the American young man nodded slightly to himself and moved... 21.c5! The Internet roared, but the enthusiasm lasted only a couple of moves: by move 24.h3?! all the engines were sadly back to a drawn evaluation. Now, all the hysterics came from the evaluation of a super-computer equipped with a strong-issimo engine, which went 39 plies deep to find the winning variation. And again, it's human beings at the board. But we like to get excited, in a match that has offered now eight straight draws in a row. Anyway, today's game was a close shave for the Champion, though Fabiano declared that he's never seen anything winning in the game. It's almost disappointing that the second best player in the world didn't see a win in 39 moves, isn't it? Tomorrow is a rest day, and ICC will offer everyone a video recap of games 7 and 8, by IM Michael Rahal. Seventh draw. The most used adjective on the socials is "dull". Which is understandable, in a way, though not justifiable. Chess, if played well, is a difficult game to win. These two guys sitting there in London are the strongest players in the world and, unless one of them blunders, there is very little chance that a game will see a winner. People start criticizing the format, saying that a match is deadly boring. In the era of the databases, and with the top players preparing with maniacal meticulosity, it's quite normal to see draw after draw. Game 1 and game 6 had some thrill, and though saying that in game 6 Caruana was winning is a bit of a stretch, Carlsen missing Rc3 in game 1 was a bit of a shock. There have been moments of excitement, especially considering that this is mostly a battle of nerves. It's clear that the two foes are at the same level; to prevail in this match there will have to be something exceptional happening. Too bad that - most probably - the exceptional things will happen in the tiebreaks. 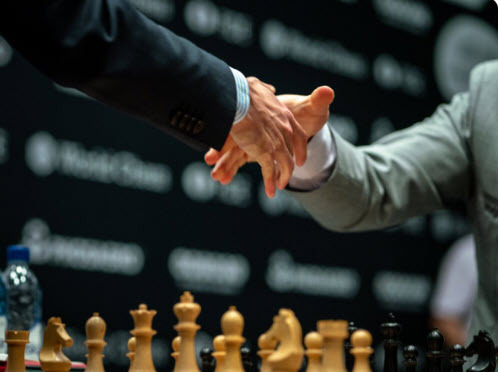 This leads us to ask the mother of all questions: is it right to assign a world championship title by means of Rapid and Blitz games? As the great Alessandro Manzoni wrote, "Posterity the arduous verdict will declare". After the first six games, Carlsen and Caruana are tied 3-3. GM Alex Yermolinaky analyzes the last two games and shares his impressions of the first half of the epic battle for the crown. Black is the new White. At least in this match. 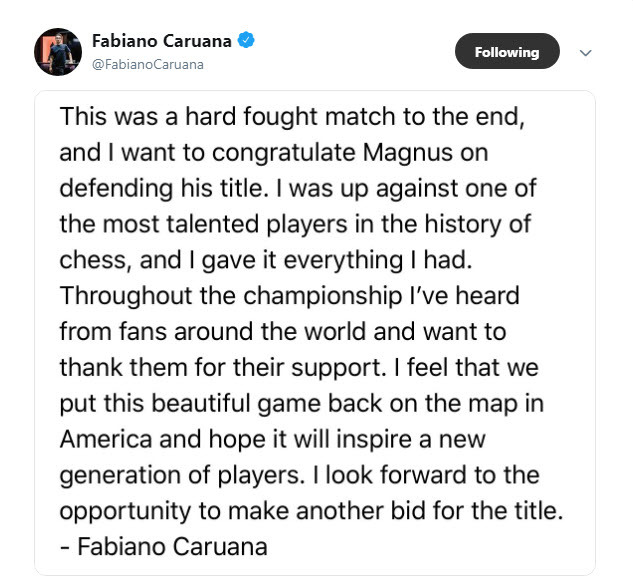 We all were concerned about Fabiano having to play two games in a row with the black pieces, but in game 6 the American was the only one to have chances to interrupt the series of draws that is characterizing the encounter for the crown. At a point, it looked like Carlsen was going down, and the excitement of the fans skyrocketed. But the genius from Norway held up, sacrificing a piece for two pawns, knowing that Caruana would have pushed for hours in the attempt to finally score, but with no success. It was probably nothing serious for the WC, but we, the people, thought something amazing was going to happen, and unleashed our excitement on the socials. Even Nakamura tweeted something on the line "if this endgame is a draw, then chess is irremediably drawn". Not really. Carlsen had calculated rightly. He's commonly regarded as an endgame wizard, and today he showed once more that it's super-hard to beat him. Especially because Magnus knows he's playing a human being, and not some abstruse super-computer which saw a mate in 33 (! ), after an alleged "blunder" played by the World Champion in the endgame. So, it the sixth draw out of six games, with some probably exaggerated noise in game 6. Now, as Dante Alighieri, the greatest Italian poet wrote, 800 years ago: "Nel mezzo del cammin di nostra vita, mi ritrovai per una selva oscura, ché la diritta via era smarrita" - "Midway upon the journey of our life I found myself within a forest dark, for the straightforward pathway had been lost": the two contestants are sinking into a sort of depressing immobilism. Neither seems to be able to force a mistake or to outplay the other. The games slide away without any real gasp. Too smooth, too "equal". And, though this adds up to the uncertainty of the outcome, the public is getting restless. The socials are flooded with satirical comments. GM Alexander Grischuk today came out with a hilarious comment: "Kramnik told me in France they're going to have a reality show. They'll put some cameras in the coffin & there'll just be a dead body in the coffin-lights & cameras. Twice per day 15 minutes on TV with highlights & 24/7 on the internet. It's about as exciting as this game!". Probably just a bit too much, but it gives the idea on how people feel about the match. Actually, the level of these games is extremely good. It's a battle of nerves, and under such gargantuan pressure, these two young men managed to play good chess, without blunders or weak moves. Chess at this level, and with the World Champion's Crown at stake, is something that's not easy to grasp for the vast majority of us mere mortals. Of course, we do need to comment and express our frustration, to participate and feel part of the community that is following this amazing event worldwide. November the 17th is a rest day, and ICC's GM Alex Yermolinsky recaps and analyzes games 5 and 6 for us LIVE on ICC's YouTube channel. Don't miss Yermo's show. Another draw. That's what stands out, obviously. But today Caruana, knowing that now he will have to face his mighty opponent two times in a row with black, tried to spice up the game in the opening. In a Sicilian - again - Fabiano played 6.b4!?! Not a novelty, as it was played more than once, and notably in Fischer-Spassky 1992. Carlsen looked a bit surprised, from his facial expressions, but he was able to play through it with apparent ease, and even got what we might call a very slight advantage. Not anything that would allow fireworks, but playing black and coming out of the opening equal is already good. After "neutralizing" Fabi's surprise, Magnus played solidly, and Fabiano did the same. The game went quickly into a very equal position, and the two chess wizards agreed on a draw at move 33. The first of the three out of four games in a row Carlsen will play with White is over, and Caruana managed to stop any initiative and hold the Champion to a draw in game 4. So, after four games, the tension keeps mounting as neither of the contestants has been able to score a full point. And it's due to get higher as the games go by. In a short 12-game match, losing a game can be deadly, especially in such a balanced match. It is true that a victory would change the whole psychological aspect of the match, but these guys have nerves made of steel, and with a full point of advantage, the match would look shorter and shorter. On the other hand, should the equilibrium resist until the end, the tiebreaks favor Carlsen, who is the strongest Blitz player ever. Maybe in Rapid play Caruana will be able to resist the hurricane, but in Blitz, he's just got no chances at all. This is why probably Caruana, as soon as he gets back playing white, will have to push a bit more, be less cautious, try something to throw Carlsen off balance, and see if he can squeeze in a win. Tomorrow is a rest day, and ICC will publish a video-recap - FREE for everyone to watch. As almost always happens, a World Championship Match is a psychological war. These first three games have shown how delicate is the equilibrium, and how difficult is for the two foes to maintain their focus, to back up every decision they have to take at the board. the media are on the two young men, reporting every facial expression, every gesture. And probably this adds on the pressure. 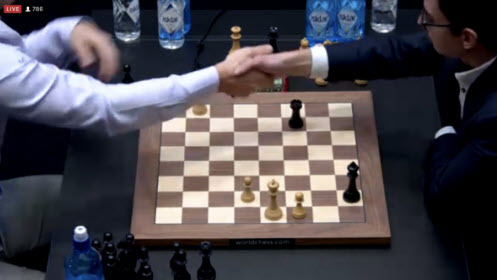 Today Twitter has been flooded for a while about Carlsen touching a Knight, and the moving another piece. everyone knows that this is not allowed, and the people on Twitter were claiming that nobody had heard the Champion utter the usual formula "j'adoube" before touching the knight. 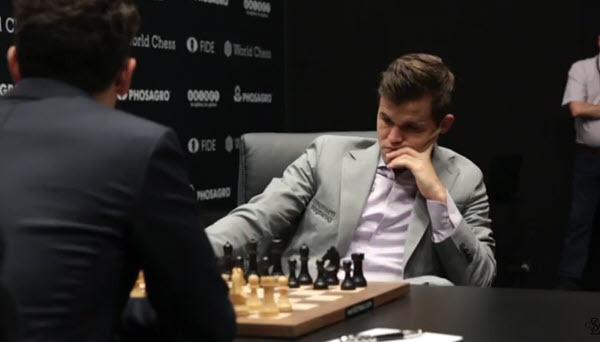 Of course, Carlsen had declared his intention to adjust the knight's position on the board, but everyone needed a moment of thrilling to revive a game that, for the vast majority of the viewers, was trailing slowly but implacably to another draw. Caruana is holding the proverbial ability of the champion in endgames at bay, at least for now. The American, in these first three games, was able to keep himself away from the strangling technique of Python Carlsen. Today Carlsen said that he has never been playing for a win in the third game, and that makes it clear how hard is this epic match. After the first two games, Carlsen and Caruana are tied 1-1. GM Alex Yermolinaky analyzes the games and shares with us his impressions on this beginning of the epic battle for the crown. After the epic struggle Caruana had to face in Game 1, today the American with an Italian name looked much more comfortable at the board, holding with relative ease a draw with the black pieces. Fabiano was never in trouble, and entered a rook endgame with a better pawn structure. Carlsen opened with 1.d4, and then the game went on into a Clasiccal Queen Gambit Declined (with 5.Bf4). A very well known opening played at any level. The fans, after the battle they witnessed yesterday, were probably expecting the two foes to go on and on, trying to tire out each other. But his time Carlsen didn't feel like "waiting and hoping for a blunder", in a slightly worse position, and they agreed to draw the game at move 49. Tomorrow is a rest day. GM Alex Yermolinsky, at 5 PM EST (23:00 CET), will analyze the first two games and share his feelings LIVE on the ICC YouTube Channel. Don't miss Alex's LIVE show! Here is the link to WATCH Here is today's game. 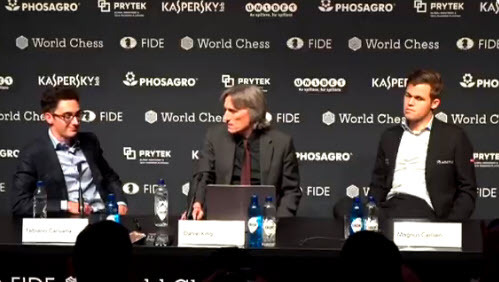 The game was a rollercoaster and Caruana said that he was lucky to have survived it. But he's shown how resilient a true champion can and must be. If this is just the beginning, man, we're doomed! Here is the game. The most awaited event of this frantic - chess-wise - 2018, is finally here! 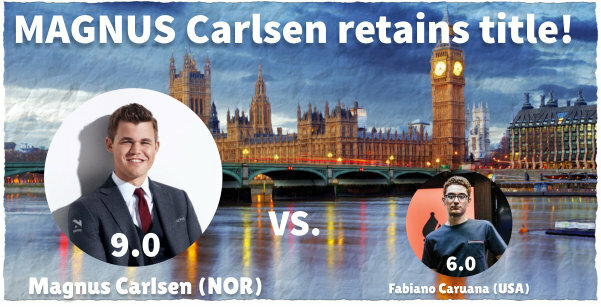 November the 9th, at 10 AM EST (16:00 CET), the World Championship Match played between Magnus Carlsen (NOR) and Fabiano Caruana (USA) starts, for the joy of millions of fans around the globe. One can't avoid mentioning that for the first time since Bobby Fischer in 1972, an American is playing in a World Championship match. Obviously, the main question is: How many possibilities are there that we'll see a change at the top of the chess Olympus? I wish we had a crystal ball, or maybe not. It's actually a nice feeling having to wait and enjoy the match, game by game, move by move. The signs lead to think that this will be a tough match, and that's what is needed to make the event a great happening. 2018 has been Fabiano's year, with his successes and the rating skyrocketing, leading the American to a tiny 3-point gap. In the last years, nobody has ever been so close to overcoming Magnus as Numero Uno. Magnus has the experience, and should the match go to rapid and blitz, he's the great favorite and, last but not least, he's Magnus, the strongest living chess player. The Internet Chess Club will relay the moves LIVE, have recap shows during some of the numerous rest days, and a final show after the match is over. All the shows will be broadcast LIVE on ICC's YouTube channel.